Have Nike's sales jumped 31% after signing Kaepernick? Many news orgs are writing about Nike's online sales jump of 31%, like this one from NBC or this one from Market Watch. Nike sales jumped by 31 percent after debuting quarterback-turned-activist Colin Kaepernick as a new company spokesman — and market observers say the president’s public displays of anger may have backfired by drawing more attention to Nike. This sales jump is from sales data from Sunday, September 2, 2018 through Tuesday, September 4, and is comparing year over year sales. That being said, Nike didn't announce the partnership until Labor Day (the 3rd) and didn't air the commercial until Thursday the 6th. The clear intent of the article is that the partnership between Kaepernick and Nike and the message of the ad directly contributed to Nike's 31% year-over-year increase in sales. However, the claim that the online sales jumped 31% due solely to the ad is, to me, suspect as the dates involved include non-campaign days and the Labor Day event included other promotions by both Nike and its distributors. 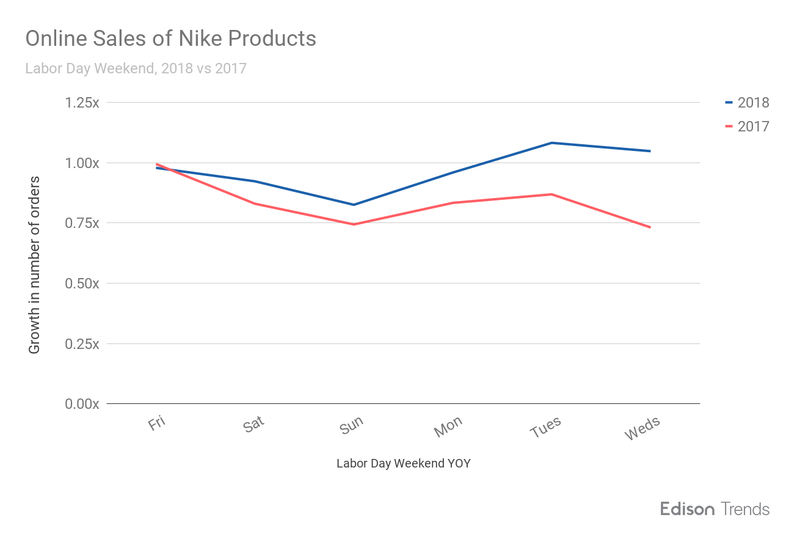 It is true to state that Nike's sales jumped by 31%, however, it seems false to attribute that jump solely to the partnership, if not least because of the inclusion of non-campaign days in the data. So, what was the real sales jump due to the partnership and ad with Kaepernick? "1x" means "1x the number of Nike product orders sold on August 1, 2017." Data collected from receipts from over 200 online vendors, using "Nike" as a search term. As the chart says, it's an increase in online sales. Because last year's graph also shows an increase (17% between Sunday and Tuesday), it is doubtful that this increase is entirely due to the advertisement. The campaign had sparked an initial jump in sales, with online sales climbing 27 percent between Sunday and Wednesday of Labor Day weekend, according to Edison Trends, a digital-commerce researcher. CNBC article, Published 8:35 AM ET Thu, 13 Sept 2018 Updated 11:05 AM ET Thu, 13 Sept 2018. Not the answer you're looking for? Browse other questions tagged marketing .